Tonal quality and response to vocal performance, close miking, and room ambience are quick to satisfy without laborious tweaking and compromise. Plenty of vocal "reach" and capability for adjustment to taste will result in very pleasing character and mix placement. One reason is that the unit provides input level and output level controls. These have plenty of articulation throughout the entire control latitude with every combination ranging from a clean and pure Diana Krall or Natalie Cole type performance to a "Helter Skelter", "Revolution" type of frizzled up tidal wave wall of sound. "The Preamp" for vocal work [your clients will love you!]. Acoustic instruments are exceptionally translucent. 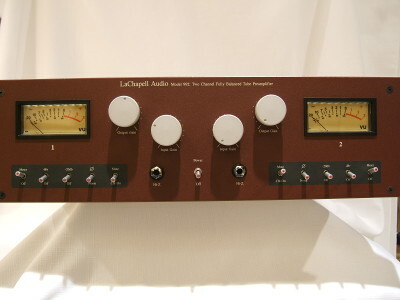 The LaChapell 992EG: Dual Tube Mic Preamp incorporates Jensen transformers, is completely transformer I/O interfaced, and uses 12AX7 tubes. The units are shipped with a J/J stock tube set. When available, premium tubes may be requested at additional cost. The premium tube set would have choices of BugleBoy, Amperex, Telefunken, Mullard. If you would like a softer gain character, you can refit 6072/12AY7 tubes into the 12AX7 sockets instead. The 992EG has gain latitude to accommodate both high output condenser mics as well as low output ribbon mics. 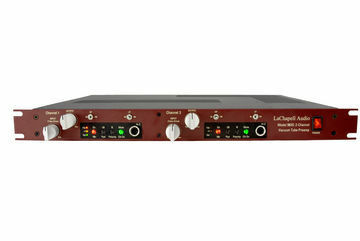 LaChapell Audio 992EG will be a necessary tube preamp asset for a guarantee on superb recording results! YOUR CLIENTS WILL LOVE YOU FOR HAVING ONE ON HAND!!! 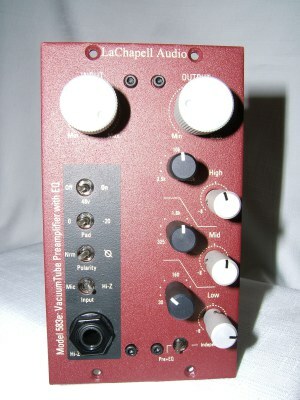 Next up.. the LaChapell 583s mkII: 500 Series Tube Mic Preamp is a single channel modular retrofit preamp for installation into API series 500 mixer chassis and lunchbox power supplies. It has same control features as the 992EG but operates with a single 12AX7 tube and other related amplifier gain components, providing 72 db gain!. It is VPR certified! Unit features 48v phantom power, polarity switch, -20 db attenuation pad switch, and mic/Hi-Z input selection. We found this preamp exceptional for a number of vocal and acoustic instrument work as well, highly complementing and beautiful results in duet with Telefunken microphones. The LaChapell Audio Model 583s is the world’s first vacuum tube preamplifier designed for the 500 series format. Now the 583S mk2 is a single bay unit! 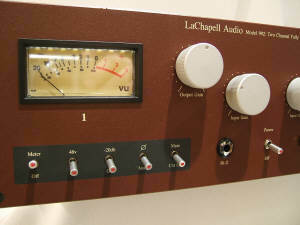 The LaChapell Audio 583S mk2 is the latest example of LaChapell's legendary 583 vacuum tube preamplifier for the 500 series format. Based largely on our 992EG, the 583s mk2 is the perfect solution for those looking to add that extra warmth and character to their “lunch box” with versatility that only a properly powered 12AX7 vacuum tube can provide. POWER SUPPLY The 583S mk2, was built to meet API/VPR certification requirements. Using multiple internal DC/DC converters, the 583’s 12AX7 tube enjoys proper power for both plate (250 volts) and filament (12 volts). 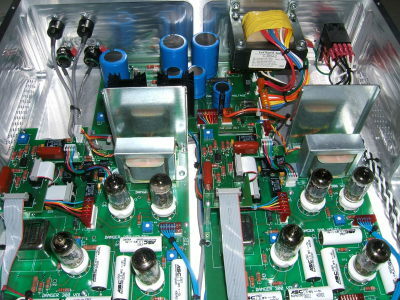 Unlike some other tube preamps for the 500 series, we do not starve the tube of voltages in any way. 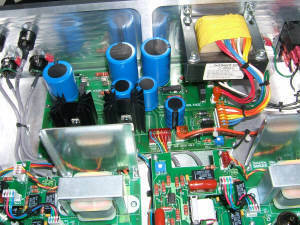 And, since this all occurs within the 583 module, there is no worry of harming your 500 series power supply. COMPONENTS The 583s mk2 features the CineMag CMMI-10 microphone input transformer and Jensen’s best line output transformer; the JT-11. Typical preamplifier features are available as well including 48v, a 20 dB pad and polarity reverse. The mk2 also sports an auto-switching, transformer-less Hi-Z input for instruments. CONTROLS In operation, the user has individual control over the input and output gain stages via 41-position potentiometers. This, like its 992 older brother, provides total flexibility to explore the 583s’ broad sonic pallet; enhancing its versatility for all of your recordings. The new mk2 also includes a convenient handle for easy insertion and removal. 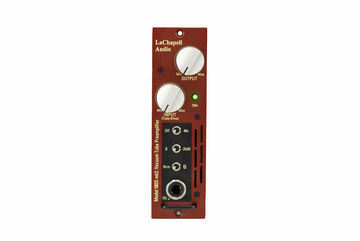 To augment the features of the 583s, LaChapell produces the 583e, which incorporates a highly effective, fully parametric EQ section for furthering sonic detail and embellishment. Again, as with the 583s, unit features 48v phantom power, polarity switch, -20 db attenuation pad switch, and mic/Hi-Z input selection. Input transformer is a Jensen JT-115k... EQ section is transformerless.